Those who’ve visited Clicker.com know that it’s known as the most comprehensive guide to Internet television around, not to mention a healthy database for webseries, movies, and regular television shows. Fortunately for frequent visitors, they’ve just released an iPhone/iPod Touch companion app that will allow you to search Clicker’s database, check-in to tell your friends what you’re watching, find out what’s popular amongst your friends and other users, and add shows to your Playlist for future viewing. Think foursquare, but for TV! First things first, you have to have a Clicker account, so either sign up online or through the app (log in with your usual information if you already have one). The Social tab lists any activity your friends have done on Clicker; you can switch over to Trending to see what’s the latest big thing stirring up the Clicker users. The Search tab is probably where you’ll spend the majority of your time, as that’s where you’ll go find the shows you’re currently obsessing over. And with over one million shows, episodes, and movies (for the statistics-happy people: more than 750,000 episodes from over 12,000 shows from over 2,500 networks, 30,000 movies, and 90,000 music videos from 20,000 artists), you’re sure to find what you’re looking for. Tapping on a show is like opening up a Wiki/IMDb page, as you can find information such as a series synopsis, episode list, network, category, etc. etc. Even the individual episodes can have their own synopsis. Here’s where the social networking aspect of Clicker kicks in: you can add the show to your playlist, rate/discuss it, and Check-in with an optional comment (all of the above goes for the individual episodes as well). Anybody looking through the show’s Activity will see who else has done any of these actions, and you can take a peek through their profiles to pick up recommendations of what to watch next (if they like what you like, they’re bound to have good taste, right?). One of the coolest things about Internet TV is that much of the content is free, which is reflected in Clicker. You can watch free episodes on your device for the awesome price of free, and if they aren’t, there’s usually a link that will take you to the iTunes store to download episodes. If you look beneath the search bar, you can see filters that you can utilize to find iPhone-only shows (a.k.a. shows that you can watch on your device). 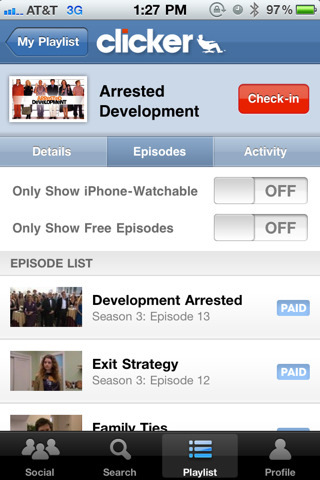 If you’re in an Episodes listing, you can filter through them to see which episodes are free/viewable. The last tab, Profile, lists all of your past Activity history, your friends, and the Awards and Badges you’ve won for all your hard TV viewing work. That’s my kind of strenuous activity. In this era of social networking and (over)sharing, why not let others know what your TV watching habits are like? The Clicker app is perfect for that, but keep in mind it only works well if many users are utilizing it–it’s hard to be social or network with a small group (it also helps a lot to have an internet connection). Clicker.com does have an impressively extensive database, however, and seems to be extremely well-rounded in terms of representing different types of media. And they’re promising integration with even more content sources! As an information sponge, I like. It’s also a nice way of keeping track of what you’re watching, because heavy TV users can have a hard time keeping track of all those different time slots and hiatuses and seasons, doncha know? And of course, the price tag (free!) and the ability to catch up with your shows (possibly for free) is a huge incentive to keep this handy little app around. Happy viewing! AppSafari review of Clicker was written by Julie Guan on August 28th, 2010 and categorized under App Store, Free, Social, TV, Video. Page viewed 5539 times, 2 so far today. Need help on using these apps? Please read the Help Page.